Successfully Added Rugged Android Phone AGM A8 SE - IP68, Android 7.0, Dual-IMEI, 4G, Quad-Core CPU, 2GB RAM, 1080p Display to your Shopping Cart. The AGM A8 SE is an ultra-tough rugged phone that will follow you anywhere you go. If you work in rough environments or simply spent a lot of time in the out doors, this Android phone is perfect for you. With its IP68 waterproof body, this rugged smartphone is fully resistant to water, dust, and drops. This takes away all your fears of accidentally damaging your device in any way. It furthermore packs a powerful 4050mAh battery that brings along up to 4 hours of continuous usage time and 120 hours standby time. This provides you with enough juice to get through the longest of days without needing to recharge. This cell phone runs on an Android 7.0 operating system. You will be treated to the latest software features available and will be able to enjoy them without experiencing any lag. It furthermore packs a Quad-Core processor and 2GB RAM. Together, this hardware is capable of tackling all basic Apps and games out there. Whether you simply use it to make calls or like to play games and watch movies – this rugged Android phone is sure to handle your demands. All media can be enjoyed on the phone’s stunning 5 Inch FHD display that portraits your images in breathtaking 1080p resolution. To treat you to ultimate connectivity, this Android phone supports Dual-IMEI numbers. This means that you’ll always be able to stay connected to two 4G network providers at the same time. Friends and family can reach you on two phone number simultaneously so you will never be out of reach. With 4G support, you can furthermore enjoy the fastest mobile data speeds available. From now on, you can browse the web and download files at lightning speeds no matter where you’re at. 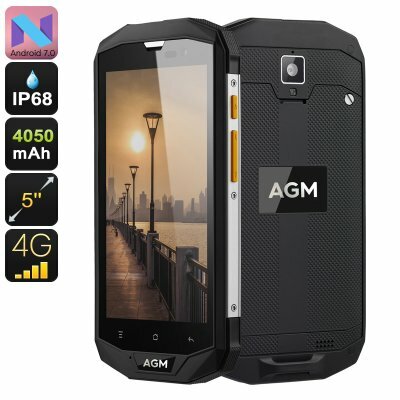 The AGM A8 SE Android Phone comes with a 12 months warranty, brought to you by the leader in electronic devices as well as wholesale Rugged Phones.. I am very happy my orderan has arrived, although it is 1.5 months, maybe because of free shipping. better to use EMS for delivery to Indonesia.